Often referred to as the “secret ingredient” in David’s tone, the Alembic F-2B first made it’s appearance in the rig during the summer rehearsals in 1974. As David’s rig grew bigger and more complex this little unit served as the main power station for over two decades. The Alembic appeared in the late 60â€™s inspired by the cirquit on the Fender Dual Showman amps, which were known for their super clean powerful tone. The F-2B is a stereo preamp with a 12AX7 tube in each section and controls for bass, treble mids and volume and a bright/normal switch. - The Alembic F-2B (red knobs), as seen in David The Wall stage rig, lying on top of the MXR digital delay. 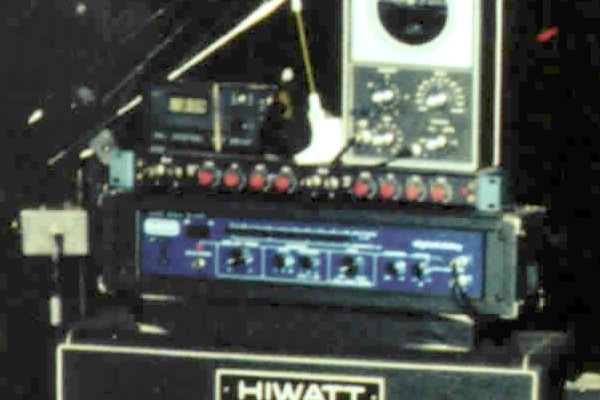 Using preamps in addition to the Hiwatts and Leslies was nothing new as David had also incorporated HH Electronic IC-100 solid state bass amps on the 1971-72 tours. Originally, the Alembic belonged to Waters and as an experiment Phil Taylor tried it in David’s rig. It acts as an EQ enhancing the lower sub frequencies. They placed an extra tube in the preamp section to give it a little more drive, lowered the impedance in the output and changed the capacitor in the bottom end to eliminate some of the lows. In the 70’s the Alembic served as the main preamp for David’s Leslie rotating speaker cabinets – later the Yamahas – which again where mixed with the signal from the Hiwatts. This setup was used on all tours from 1974-1981. The classic setup with the Yamaha RA200 and the Alembic F-2B preamp lying on top to the far left, pictured in David’s home recording studio in 2014. After using a slightly different rig in 1984 and 1987 mainly consisting of Fender and Mesa/Boogie amps and the Alembic was once again featured in David’s 1988-90 and 1994 rigs. At this stage, Pete Cornish had removed all the preamps the the Hiwatts and the Alembic now served as the main preamp for the whole setup. The Alembic preamp was once again employed by David for the Barn Jam sessions in early 2007. Again, the unit was used as a preamp for the Yamaha RA200 rotating speaker cabinet. The setup is currently located in David’s home studio, Medina (Hove UK), where it was used for the 2014 Endless River recording sessions. 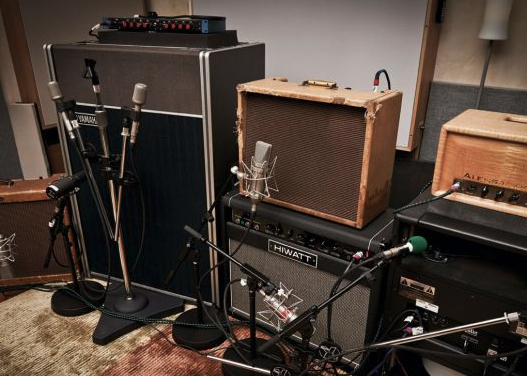 See the David Gilmour Gear Guide for a complete setup on each album and tour.